Edge Cleaning Technology Reaches in and Under! This Special Offer is Not Available Anywhere in Stores! Triple Rotating Brushes that loosen, lift, and channel the dirt & debris onto the onboard dust pan. Perfect for cleaning while the baby is sleeping or while watching TV. 30-Day Money Back Guarantee (Less P&H). Please return (postage pre-paid) to address listed on the Return Page. Please be sure to include your complete name, address, daytime telephone number and email address inside the return package when returning your item. 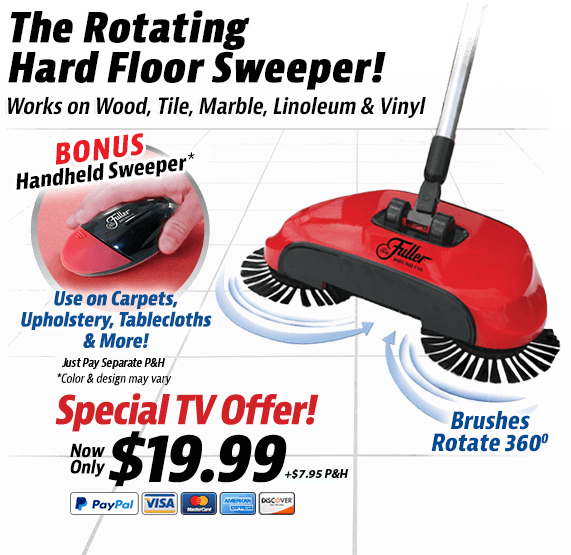 When ordering today, you will receive the Roto Sweep™ for only $19.99 plus $7.95 P&H. As a SPECIAL GIFT to you, we will also include the BONUS Handheld Sweeper in your order today, just pay separate $7.95 P&H.